I’m now 34 weeks pregnant and therefore nearing the end. I’ve said I’m only have two kiddiwinks so this is me coming to the end of the whole pregnancy stage forever! With that in mind I’ve been looking back and thinking about things. Here’s ten thoughts about my pregnancy journey. Some things I’m going to miss, some things I sure as hell won’t miss! Oh boy I’ve been uncomfortable this time around. Of course this time around I have a toddler to chase around as well. I’ve had terrible backache and just recently I’m struggling to bend down. I feel so much bigger this time. When I was pregnant with Little Miss I didn’t feel (or look) big until she was overdue. If truth be told I didn’t invest in. Cub maternity wear. Mainly because I’m not very fashionable and secondly unless I really needed to I wasn’t about to spend money unnecessarily. My maternity wear consisted of a couple t-shirt and a pair of maternity jeans. The jeans were not very comfy so I’ll be glad to see the back of them! 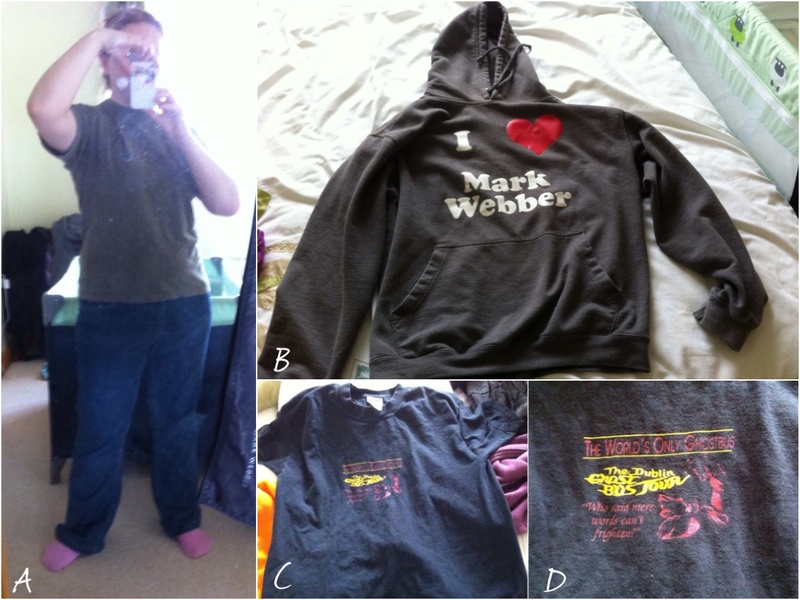 A – My typical look /B – I <3 Mark Webber hoodie / C+D – Dublin Ghost Bus t-shirt which is about 15 years old! This time round I’ve been struggling with a bit of guilt. The guilt happens when I’m cuddling my Little Miss who of course is currently my whole world. The guilt kicks in because soon there’ll be another little one demanding my attention and I just can’t imagine how Little Miss will adjust. I am feeling sad because this is the last time I’ll be carrying a baby. It is such a special thing and still amazes me that I feel sad that I won’t be doing it again. I’ve had such a lovely and fantastic midwife that I will actually miss the visits! I won’t miss the waiting though (she’s always late!)! I just hope I’ll see her around afterwards. I had to go to hospital last week for a growth scan (everything was fine) but whilst waiting in the ANDU for a doctor to tell me everything was fine I felt a cold sweat creep over me. The ANDU ward is next door to the labour ward and sitting there just brought back all the memories of giving birth to Little Miss. Unfortunately I won’t have a choice this time around and will guaranteed end up in hospital. At least pre Little Miss I lived in denial and was planning a homebirth! I won’t go into too much detail about symptoms but I must admit that I will not miss having to take iron tablets. I also won’t miss the bladder issues (I won’t go into more detail!) and the awful heartburn! Honestly I should’ve bought shares in whoever produces Love Hearts because I’ve gone through tons! I don’t know why but they do help! I have the feeling that this baby will try and escape and that this time I will experience the whole natural birth that I didn’t experience last time around. It fills me with fear! I’m a wuss and am scared of the pain! I have 2 days – count them T-W-O days left of work!! As much as I love work, I am so looking forward to maternity leave this time! I’m just so tired now that I feel like I could do with a couple of weeks rest before Baby 2 arrives. I’m planning on another Ugly Betty marathon! We went to The Baby Show a two weeks ago and there were a lot of newborns around. I must admit I got all broody and it made me realise that I am really looking forward to meeting Baby No 2. I can’t remember Little Miss as the teeny tiny baby that she once was and I’m looking forward to having those little tiny cuddles again! Aww, this makes me want a baby! Even tales of horrible pregnancies don’t put me off! Truthfully my pregnancies haven’t been too bad – some women have it way worse! I mena I didn’t even get morning sickness! I think it’s going to be a big adjustment for her but she won’t remember it and hopefully will grow up best of friends! awe so close! yay for maternity leave starting soon! I know! Maternity leave has now officially started! !